Thank you to our sponsors, exhibitors and attendees for making the 2019 Cabin Fever show a success. We are busy making plans for next years event. Details will be posted here. 10:00am – 11:00am Josh Miller– How to catch more fish than you thought possible. Informative seminars on fly fishing techniques. Raffles for great fly fishing equipment. Flea market area for great deals on vintage tackle. Fly Casting & Fly Tying demonstrations. Download the Vendor Letter and Application below. Space is limited. Example details from past shows. Over 60 Exhibitors including fly tiers, guide services, rod builders, fly shops, and rod & reel manufacturers. Fly tying demonstrations and a kids table set up so they can tie their own flys! Flea market area for great deals on vintage tackle and a chance to sell some of your old gear your wife says you have to much of. Cabin Fever is shaping up to be the best exhibitor experience we have ever had. With well known speakers, interactive demos and a great selection of guides and manufaturers, attendance is expected to be very high. 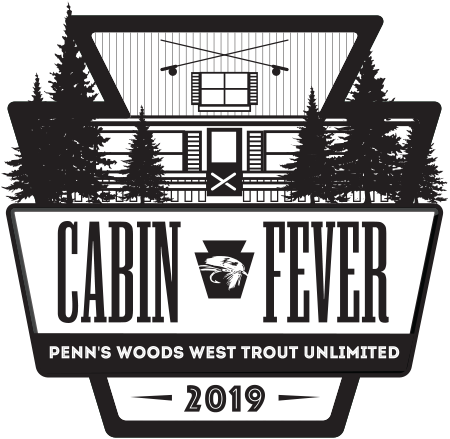 Copyright - Penn’s Woods West Trout Unlimited • Site built by and hosted by - In-House Graphics Inc.